This manual describes the principles to be followed when selecting the most appropriate techniques for the safe abatement of asbestos-containing materials. Order printed copies of the manual from Alberta Queen’s Printer. 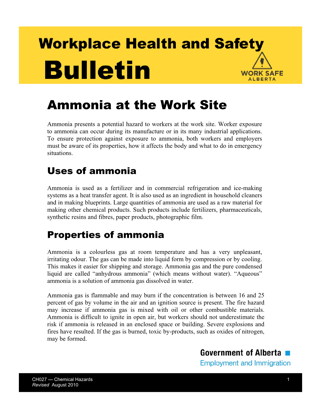 Ammonia in the workplace what is it and how do I prevent it? 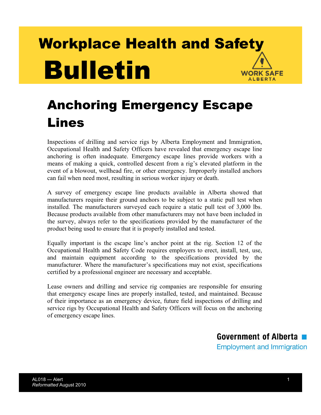 Emergency escape lines provide workers with a means of making a quick, controlled descent from a rig's elevated platform in theevent of a blowout, wellhead fire, or other emergency. Doing brake repair can involve the use of asbestos exposure. How can I take precautions? General precautions when dealing with Asbestos demolition and renovations. Consolidation of the asbestos provisions into one piece of legislation under the jurisdiction of one department was done at the request of stakeholders to simplify the requirements for users.